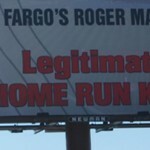 Fargo, North Dakota loves Roger Maris. As you can see from the sign above, he is a source of pride for the city as he is, of course, the only player in major league history to legitimately hit more than 60 untainted home runs in one season. I say legitimately since he is now 7th on the overall list behind admitted steroid user Mark McGwire, and assumed steroid users Sammy Sosa and Barry Bonds. In 1961, Americans were glued to their nightly sports report and morning papers to see if Maris, or teammate and Hall of Famer Mickey Mantle would beak Babe Ruth’s three-decade-old record of 60 home runs. The record is one that even Roger Maris himself, just before the 1961 season, said was unbreakable and even unapproachable. The season was hard on Roger, so stressful in fact, that at times as he was nearing the record, he would lose his hair in bunches and his stomach was almost constantly in knots. And, though he did break the single-season record, he was forever jaded and never felt accepted by the media. But, he’s still not in the Hall of Fame, because, in the eyes of the writers, he had only one other substantial season. And, thanks to the mountainous stats piled up in recent years by the unnaturally bulked-up supermen, he may never join the likes of his 1961 murderer’s row teammates Yogi Berra and Mickey Mantle in the hallowed halls. Somehow it seems fitting that a man whose career will likely be forgotten as baseball’s pre-steroid days blur into oblivion has a museum parked in an aging suburban mall between Sears and a Pet Store. For more information about the Roger Maris Museum, click here.